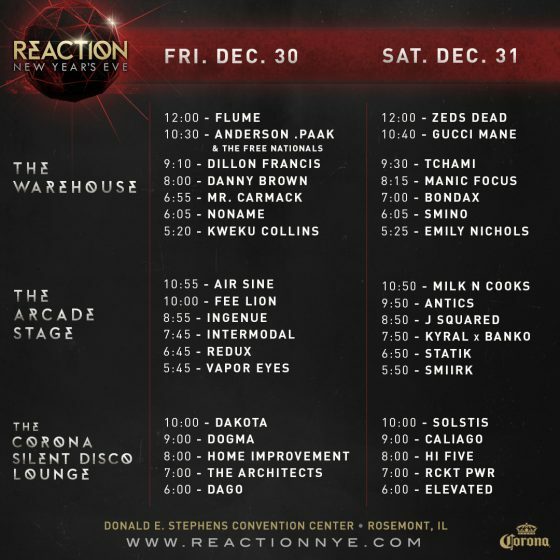 Reaction New Year’s Eve is returning to Chicago for another 2 days filled with your favorite artists! Chicagoland’s biggest New Year’s celebration will take place on December 30 and 31 for its second year at Donald E. Stevens Convention Center in Rosemont. This year, Grammy-nominated Flume will be headlining Friday, December 30th and the big name bass duo Zeds Dead will be headlining Saturday, December 31st. React presents unsurprisingly delivers another spectacular lineup including a variety of dance, R&B, and hip-hop artists — Anderson .Paak, Tchami, Dillon Francis, and Gucci Mane to name a few. The 2-day warehouse-style event will host some of this year’s most popular artists and a handful of rising local artists across the 3 different staging areas: The Warehouse, The Arcade Stage, and the new Silent Disco Lounge (Check out the schedule below). There is plenty beyond the music this year at Reaction. 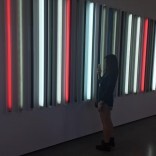 Alongside the music, enjoy classic arcade games at the Arcade Stage and check out the newly added Art Gallery that will showcase work from local artists. For those of you looking for the full New Year’s Eve experience, VIP packages with access to private bars, VIP viewing areas, and other amenities will be available to 21+ guests. You won’t want to miss out on this chance to ring in the New Year at Reaction! 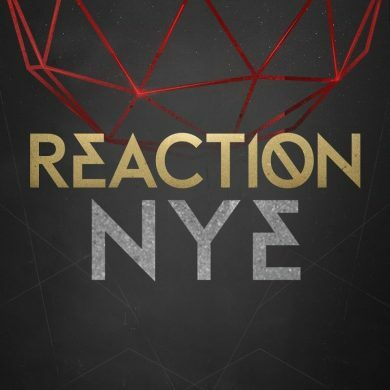 For more information and tickets, visit www.reactionnye.com!